Early morning in Tehran, and two mobile cranes are being manouvered into place. They are to act as temporary gallows for a public execution. Already the crowd are out in force, some of them in a remarkably cheery mood. A few are getting ready to photograph the scene on their mobile phones. There are even one or two young children around. Amid this strangely everyday scene, the black-masked hangmen begin their work. They attach nooses to the cranes, check they are secure. As the sentence is read out, the two criminals are brought out. They have been convicted of bank robberies and murders, including the murder of a senior judge, close to this very spot in Tehran. But there is no sign of remorse. 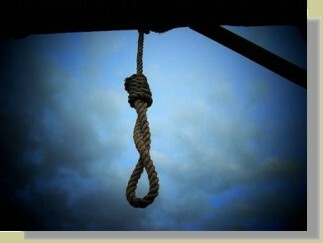 In fact, one of the two men can't stop smiling, even as the noose is put around his neck. Then swiftly the stool is pulled from under their legs. The bodies are left dangling - a lesson for everyone to see. Under the government of President Mahmoud Ahmadinejad, the number of executions has increased dramatically. Amnesty International says the figures are up from 200 executions in 2006 to about 300 last year, and there have been more than 30 in the first month of this year alone. The Iranian government says the executions are necessary to deter hardened criminals - murderers, drug dealers and rapists. Ayatollah Mahdi Hadavi, a professor of Islamic law based in the holy city of Qom, explained this interpretation of Islam. "In Islam, punishment is very harsh," he said. "Because the philosophy of punishment is to prevent the people from committing a crime." In future that may include fewer public executions. The most recent was held in January. But now Iran's chief judge has ordered that none should be held without his personal authorisation. However, a similar edict stopping the punishment of stoning to death does not seem to have been obeyed. One man was stoned to death in Iran last year, after being convicted of adultery. Human rights groups say two sisters, Zohreh and Azar Kabiri, now face the same penalty, after they were also convicted of adultery. Both are mothers, each with one child. To add to this challenging list of punishments, the Iranian Nobel peace prize winner and human rights lawyer, Shirin Ebadi, has warned of a revival of the practice of amputation. She said that several criminals in the remote province of Sistan-Baluchistan had recently had hands and legs amputated. The violation of human rights in Iran had found new dimensions, warned the group of lawyers that she heads. Ms Ebadi says she believes that there is a political dimension to the growing number of executions: "I see this as way of putting fear into society. They want to use this to frighten people, to make people afraid of voicing criticism." It's not a charge that's likely to concern President Ahmadinejad. His government has turned to a strict interpretation of Islam as a way of reviving the revolution and controlling the population. It's hard to say how many people in Iran support these policies, though they are certainly more popular with Mr Ahmadinejad's poorer, more conservative, rural supporters. On this 29th anniversary of the Islamic revolution, the government of the Islamic republic is prouder than ever of its difference from Western liberal countries. It thrives on a confrontation with the West, not just on matters of foreign policy, but on basic questions of religious and social values. Nowhere are these differences more stark than in Iran's increasingly tough attitude to crime and punishment.